When Sun Yong launched Sunmao in June 2014, he didn't expect the app, which provides the users with information on woodworking, would become a hit. It was downloaded from the Apple's App Store more than 400,000 times in the following two months. Sunmao is the Chinese term referring to the "tenon," or the projection on a piece of wood that connects one wooden block to another in carpentry. Providing 3D diagrams of Chinese traditional wooden structures and information on carpentry tools and wood varieties, Sunmao is targeted at the growing number of China's amateur carpenters. "We now realize that it is not that young people were not interested in traditional woodcraft, but they didn't have a way to understand it," wrote Sun in an article titled, "Sunmao: China's modern tale," published in the November 2014 issue of Wissen magazine. In the last two years, DIY wood furniture and household items have become trendy in China, fueled by the emergence of carpenters' clubs, workshops and the availability of online tutorials. At zuojiaju.com, an online community for carpentry lovers, Net users around China are sharing their experiences and problems regarding DIY furniture, interior design and handcrafted woodworks. There are also accounts on platforms including Sina Weibo and the messaging app WeChat where carpentry lovers can share and exchange their ideas. Sun also has a WeChat account for woodworking enthusiasts. "People who join the group usually have a background or degree in art and experience as a designer," Sun said. "Aside from their full-time work, they have taken up a hobby in woodworking and craftsmanship. Jing Mu, who works in the IT industry in Guangzhou, Guangdong Province, is yet another woodworking enthusiast. Carpentry occupies 60 percent of his spare time. He started this hobby in 2013 with making a shoe rack by following online tutorials. "The shoe rack looked ugly but because it was my work, I really liked it," he said in an interview with the WeChat account Shouyi Xuetang, which means "Craftsman Classroom." Then, using black walnut wood and cherry wood, he handcrafted a series of chopping boards and spoons. He likes sharing his experience with others in his Weibo account, including a warning to amateur carpenters: Wear safety gloves. "Once, I used a wood carving tool to dig a spoon without wearing gloves, and I cut a finger on my left hand. It took a month to recover," he said. The rise of independent furniture brands featuring original designer products and customized wood furniture also contributes to people's enthusiasm for woodworking because it promotes a lifestyle of individual discovery and creation. 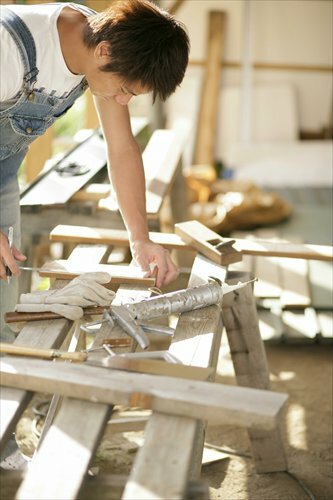 THRU, an independent furniture brand in China, has been offering carpentry training to amateur carpenters since 2011. Many white-collar workers come to practice woodworking, getting relaxed from the fast paces of life. "I enjoy becoming totally engaged in woodworking and being away from all of life's distractions. Bringing home a handmade work is one way of finding happiness," Li Gengshi, who works in the art industry, said in the Wissen article. Woodworking was once popular in the 1960s and 1970s in China, when people had to make furniture by themselves due to a lack of commercial products. "When I was a child, my father, as a retired member of the army, liked making wood furniture, such as tables, stools and cupboards," Sun said in the Wissen article. "It was a hobby, but also a way to improve his quality of life." Today, compared with countries such as the US and New Zealand, where carpentry skills are common among the general public, carpentry resources and knowledge available to Chinese people is limited. Zhang Yibin, one of the two translators for the classic carpentry guide, Woodwork: The Complete Step-By-Step Manual (2014), said in the Wissen article that he "felt that domestic woodworking was going nowhere in China," when he "discovered there was no proper Chinese translation for the various Western carpentry tools, such as the 'plough plane' and the 'marking gauge.'" But thanks to the Internet, Chinese craftsmen now can learn from DIY lessons produced by foreign carpenters. Today, Sun runs a custom woodworking studio in Beijing, where he makes household items such as computer keyboards and tea trays. "Antique woodworks should not only be preserved in museums, but passed on via modern communication platforms and ways of consumption," Sun said.